As Solidarity goes to press, the dispute in Melbourne between the CFMEU and Grocon boss, Daniel Grollo, lies at a turning point. The threat of court action against the union seems to have put the union leadership on the defensive and the possibility of a state-wide strike looks to be diminishing. If Grollo gets away with imposing company-appointed safety officers, every other building boss will want the same. Grollo can be beaten, but the strike will have to be spread. The anti-union laws and the court orders penalising unions will have to be broken. Industrial action can beat the laws if it is strong enough and determined enough. The scenes of building workers defying court orders and defending their picket line against the Victorian police were an inspiration for workers everywhere who want to see a fight to defend jobs and conditions—and not just in the building industry. Fifteen thousand teachers on a one-day strike marched through the streets of Melbourne as part of their on-going dispute with the Victorian Liberal government. Thousands of workers will rally in Queensland on September 12 to oppose the drastic cuts to jobs and services at the hands of the Campbell Newman’s Liberal-National government. In March, the Victorian nurses showed it was possible to defy the courts and the Victorian state government and win. That kind of determination is going to be needed in every state in the weeks and months ahead. The massive cutbacks coming from Campbell Newman in Queensland and his Liberal counterparts Barry O’Farrell in NSW and Ted Baillieu in Victoria are generating serious anger. In every state teachers are under attack. But Gillard’s long-awaited response to Gonski’s review of schools spending was a bitter disappointment. Labor has adopted the $6.5 billion recommended boost in funding, but any new money will be phased in between 2014 and 2020—more than three federal elections away. Gillard’s only clue about how she would boost spending was to talk of “tough budget choices”. The Financial Review is reporting that Federal Labor is planning a new round of budget cuts, including big staff cuts in the public service. All the government can offer education in the short-term is more free market fundamentalism: more “school autonomy” through giving principals power over staffing and budgets and attacking teachers whose students score badly on standardised tests. These are precisely the measures that were pioneered by former Victorian Liberal Premier Jeff Kennett and are now being pushed by the NSW and Queensland governments. Labor is entrenched in a drive to the right which is preparing the way for an Abbott government. Its refugee policy is the clearest example. Labor has chosen to compete with Abbott about who can be more anti-refugee. The logic of this has seen it revive Howard’s Pacific Solution. But Labor can’t beat the Liberals in a competition about who is more anti-refugee. Every capitulation by Labor will be met by more demands from the Liberals—to introduce temporary protection or most recently to return Sri Lankan refugees. Waiting to see how low Labor is prepared to sink is the politics of despair. The anger against the revived Pacific Solution needs to be galvanised into large demonstrations, to give refugee supporters confidence that the anti-refugee policies can be pushed back. Whether over refugees, rights at work or public services it is protests and strike action that can stop the drift to the right. Simply hoping to replace the state Liberal governments with Labor or going quiet to keep Gillard in power will not reverse the cuts or improve public services. Fighting Gillard (and the state governments) now is the best way to both defend conditions and keep Abbott out of office. We need to build pressure inside the unions for serious resistance to the state Liberals. NSW Premier Barry O’Farrell has announced plans to strip 80,000 public servants of penalty rates, annual leave loading and allowances for staff working in remote areas. Public servants will stop work on October 8—and other unions should join them. Campbell Newman’s wave of destruction through the public sector sees new job cuts announced every week as he heads towards his target of slashing at least 15,000 jobs. 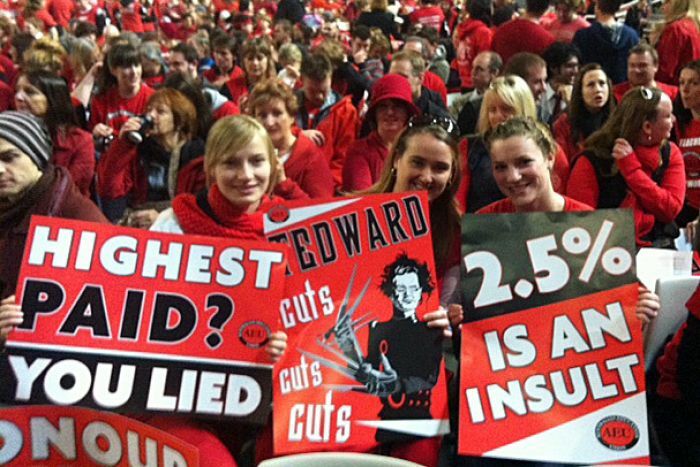 The Independent teachers have already held a successful one-day strike against the 2.7 per cent wage cap Newman is trying to impose. Queensland public school teachers are balloting for strike action in October. Grassroots campaigning and industrial action turned John Howard’s anti-refugee policies into a liability, and overturned WorkChoices. The anger, and the willingness to fight, that can be seen in every state needs to be turned into the action that can win real change.